Applicants say wood in proposed façade would mirror the tone of the historic district’s primarily masonry fabric in contemporary language. On July 8, 2014, the Landmarks Preservation Commission, in its first meeting headed by new Chair Meenakshi Srinivasan, considered a proposal for a new building on a vacant lot at 2 Fillmore Place, at the corner of Driggs Avenue, in Williamsburg, Brooklyn. The site lies in the Fillmore Place Historic District, a 29-property district that was designated in 2009. The proposed structure would be used as preschool, utilizing the Reggio Emilia educational philosophy. Attorney Richard Lobel of Sheldon Lobel, P.C. testified that in addition to Landmarks’ approval, the applicants were also seeking waivers from the Board of Standards and Appeals for floor area and wall height. Lobel said that without the variances, the school would only be able to accommodate 33 students under the City’s Health Code, rather than the planned 77 students. Architect Martin Finio of the firm Christoff Finio presented the proposed design. 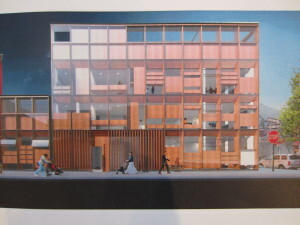 Finio stated that the proposed new building would roughly emulate the massing of a four-story building, with a one-story extension, that previously occupied the lot. The planned building would rise to three stories and incorporate an enclosure for a rooftop playground. The pattern of the facade would maintain the “cadence and rhythm” of the district’s mid-19th-century residential architecture, while being “authentic to our time.” The Fillmore Place facade would be composed of low-reflectivity glass and Douglas fir wood. Finio claimed the wood would evoke the same “warmth” as the neighborhood’s historic masonry. According to Finio, the facade’s articulation would temper the school’s “institutional presence,” giving it a more “domestic” quality. He argued that to use brick on the main facade of a contemporary building would “dilute” the historic district. On the narrower, 21-foot-wide-facade facing Driggs Avenue, the wood and glass would carry round the corner, while the eastern portion of the facade would be clad in light gray brick. Finio said the brick would prevent the school from feeling like a “glass box,” and serve as bridge to the masonry of the adjacent masonry historic architecture. Chair Srinivasan stated that Brooklyn Community Board 1 had issued a resolution recommending denial of the project as non-contextual with its surroundings. The Historic District Council’s Barbara Zay testified that the building’s height and bulk was generally appropriate, but that the use of wood and expansive amounts of glass was “incongruous” with district’s “existing palette.” Ronda Wist, speaking for the Municipal Art Society, testified in support of most aspects of the project, but objected to the blank section of gray brick on the Driggs Avenue facade, and recommended that the architects create a better transition between the building’s ground floor and the sidewalk. A representative of the Fillmore Place Historic District Association said the proposal “completely misses the contextual mark,” failing to relate to the district’s masonry character, and thereby setting an unfortunate precedent in a neighborhood facing significant development pressure. Chair Srinivasan commented that the development of the vacant lot was important to the district, and the proposal’s bulk was appropriate for the site. Commissioner Fred Bland disagreed with much of the public testimony, praising the choice of wood and glass for the facade, but recommended that the gray brick be modified with something “in the red family.” Commissioner Michael Goldblum expressed concern about the performance of the wood over an extended period of time, noting that if it were bleached by the sun, it would “significantly change” the design’s character. Goldblum also said that if the glass were not of a sufficiently low reflectivity, the facade could read as extremely “severe.” Commissioner Michael Devonshire found that the proposal, though a “departure,” would ultimately serve to enhance the district. Chair Srinivasan asked the applicants to review the materials and design of the Driggs Avenue facade, and return to Landmarks at a later date. LPC: 2 Fillmore Place, Brooklyn (15-7494) (July 8, 2014) (Architect: Christoff Finio Architecture). Tags : Brooklyn Community Board 1, Christoff Finio, Historic District Council, Meenakshi Srinivasan, Municipal Art Society, Sheldon Lobel P.C.